The 2015 Subaru Impreza is a sporty compact car that is available in five different trims. With a MSRP of just over $18,000 for the 2.0i model, this Subaru is a truly affordable vehicle. The 2.0i Sport Limited and 2.0i Sport Premium are hatchback models that provide some variety to the 4-door base trim and the 2.0i Premium and 2.0i Limited editions. Patented technology such as Boxer Engine and All Wheel Drive make the Impreza a capable car that offers superior handling and efficiency. Call or contact Glassman Subaru to schedule a test drive in the Metro Detroit area! A 6-way manually adjustable driver's seat allows you to find the right position before getting behind wheel. The front passenger has a 4-way adjustable seat for maximum comfort. A Southfield Subaru dealer will also discuss the availability of leather upholstery for customers who want an upgrade from standard cloth trimming. In fact, the steering wheel is also available in leather wrapping. With a seating capacity for five, the 2015 Subaru Impreza makes a solid family car. Standard cargo volume of 22.5 cubic feet can be expanded to more than 50 cubic feet when the rear seats are folded down. Southfield Subaru salespeople also emphasize the 97.5 cubic feet of interior space for all passengers inside the Impreza. Roof rails in the hatchback models offer additional cargo space when going on road trips or making some large purchases at the local department store. A Subaru Impreza Dealer serving Detroit Troy West Bloomfield Ferndale Michigan will enthusiastically go over all of the interior amenities and features in the 2015 Impreza. Digital console options include STARLINK 6.2-inch Multimedia, STARLINK 7-inch Multimedia Plus and STARLINK? 7-inch Multimedia Navigation. With such electronic technology, you'll find precise directions to any destination while also syncing your mobile devices and listening to great music on HD Radio or SiriusXM Satellite Radio. A Rear-vision camera is another high-tech feature in this Subaru. Bluetooth technology will also make it easy for you to connect a mobile phone and accept or dial phone calls hands-free. When visiting a Southfield Subaru dealer, you'll notice the stylish exterior of the 2015 Impreza. Aluminum alloy wheels for this new Subaru model are available in sizes that range between 15 and 17 inches. The largest wheels come with 15 total spokes. A rear spoiler adds a sporty character to this compact Subaru model. Auto dealers that have 2015 Subaru Impreza serving Detroit MI will also be glad to point out some of the advanced lighting technology in this particular model. Multi-reflector halogen headlights provide excellent illumination on the road even in pitch darkness. Additionally, the Steering responsive fog lights in the 2.0i Limited model are designed to automatically adjust to a rough or uneven terrain. Folding side mirrors and side rocker moldings enhance the profile of the Subaru Impreza. A Power tilt/sliding moonroof is another major highlight that the passengers can enjoy when cruising in this Subaru on a pleasant day. Like to schedule a test drive? Call or schedule online. The core of the powertrain of the 2015 Subaru Impreza is a signature 4-cylinder Boxer engine. The 2.0 L engine block can generate up to 148 horsepower and 145 pound-feet of maximum torque. A Lineartronic CVT is engineered to work in sync with this compact engine that has a unique configuration of cylinder in contrast to a traditional Inline layout. The innovative transmission system includes Incline Assist Mode as well as paddle shifters. There's also a six-speed manual mode that offers improved gear shifting compared to the five-speed manual transmission system that's standard in the 2.0i and 2.0i Sport Premium trims. With an EPA estimated fuel economy of up to 37 miles per gallon on the highway, the 2015 Subaru Impreza will save you some money at the gas pump. Symmetrical All-Wheel Drive in the 2015 Impreza is comparable to some of the best drivetrain technology in crossover SUVs. A Subaru Dealer serving Detroit Troy West Bloomfield Ferndale Michigan will be quick to point out that AWD is something that's rarely available in sedan and compact cars. Another impressive feature of this new Subaru is the Traction Control System (CTS) technology that ensures that all tires stay in contact with the road even on slippery surfaces. Vehicle Dyanmics Control is something that you can also count on when the tires begin to slip and slide off the road. Take a test drive. When visiting a dealer that has the 2015 Subaru Impreza serving Detroit Ferndale MI, you'll be given a tour of the amazing safety features in this new Subaru. The EyeSight driver assist technology provides alerts on dangerous lane departures and tailgating situations. The sensors in this system are also synced to adaptive cruise control to override the steering of the vehicle. Thanks to all of the digital warnings, you can minimize the risk of common types of accidents even when driving at relatively low speeds in the local neighborhood. You can rely on the 4-wheel antilock braking system and Brake Assist to come to a stop on a dime in the 2015 Impreza. The Tire Pressure Monitoring System (TPMS) provides important feedback when any one of the tires loses several PSI below the normal level. Some of the passive safety features in the 2015 Subaru Impreza include traditional front air bags combined with air bags at knee and torso level. Curtain air bags are also designed to deploy during side crashes. 2015 Subaru Impreza serving Detroit MI dealers are also glad to educate customers about the keyless entry system that can also be used to immobilize the engine during a theft. 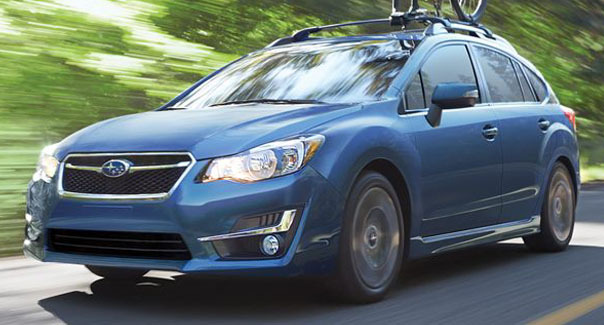 Are you interested in experiencing what the 2015 Subaru Impreza has to offer? Go ahead and schedule a test drive at a Subaru Dealer serving Detroit Troy West Bloomfield Ferndale Michigan. As you cruise in this new Subaru, you'll realize that it possesses capabilities comparable to sports cars and crossover SUVs. Be sure to ask about optional accessories such as auto-dimming side mirrors and splash guard kits. You can also customize the Subaru Impreza with a roof spoiler, mesh grille and some other cool additions. *The above information is regarding the base model 2015 Subaru Impreza. Standard specs and features may change from year to year. Contact Glassman Subaru with any questions regarding the new or used vehicle you're inquiring about.